Learn why so many people DON'T wear the most comfortable contact lenses and why you may need to change your brand of contacts to avoid dry itchy eyes. When was the last time you changed your brand or type of contact lens? Do you actually know what brand of lens you're using? How about your prescription - do you know what it is? If you're scratching your head as you don't know the answer to any or even all of the above, then the chances are you are NOT wearing the most comfortable contact lenses! Why? Because optical technology has improved dramatically over the past few years, making plastics more breathable and adding special lubricants into lenses that keep your eyes moist throughout the day. Add to that innovations like disposable lenses and soft contacts for astigmatism, a condition which affects a huge percentage of the population, and many contact lens wearers are oblivious to what is now available in the market. A friend of mine told me the other day that he couldn't stand his contacts anymore as they made his eyes feel dry and itchy after just a few hours. He's astigmatic with a difficult prescription so wears rigid gas permeable lenses - he didn't even know you can now get soft disposable lenses for astigmatism! The most comfortable contact lenses you can find, are, in my opinion, breathable contact lenses ie. ones that allow the maximum amount of oxygen to get through to the cornea, allowing your eyes to "breathe." When I first started wearing rigid gas permeable lenses 25 years ago, the plastic they were made of didn't exactly let much oxygen through. Today, however, the silicon in modern gas permeable rigid lenses actually allows more oxygen through than older types of soft contacts that are bought for 1-2 years use. More popular weekly, monthly or daily disposable contacts, however, have a higher degree of breathability thanks to innovations in contact lens technology. 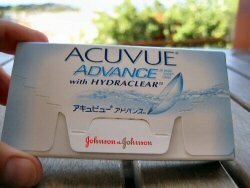 Johnson and Johnson, for example, use what they call Hydraclear technology to add a moisture-rich wetting agent to the silicon plastic making up the lens; find it in their Acuvue range of contact lenses. This means that your lenses feel soft and almost silky when popped into the eye and, as 97% of the oxygen in the air gets into your eye, your eyes don't feel dry part-way through the day. By the way, you may have guessed, but I use Acuvue Advance Hydraclear lenses with Hydraclear technology as I believe they are the most comfortable contact lenses for me. I get them from an online company called AC Lens which saves me a fortune versus what I would pay here in Cyprus. If you have exceptionally dry eyes or you only wear lenses occasionally, perhaps for sport, then you may need a lens with even more breathability. I can recommend a really comfortable daily contact lens, also made by Acuvue, called Acuvue Moist. I got these for my husband who only puts lenses in when he's doing watersports or when he's going on a long bike ride and doesn't want his prescription sunglasses to mist up. I also just got a couple of boxes for use when I'm doing watersports like water skiing (I fall in a lot!) or for when I'm travelling and they are amazingly comfortable. While daily disposable soft contact lenses are more expensive than weekly or monthly disposables, they are useful for weekends away and great for activities like trekking/camping, when it may not always be possible to wash hands thoroughly before taking out or putting in your contact lenses. I would probably switch to using Acuvue Moist every day if I could justify the expense, as I really think daily disposable soft contacts are the most comfortable contact lenses you can buy. Tip: No need to carry bottles of contact lens solution or a lens case. With daily disposable contact lenses, just pop a new pair in every day! So if your lenses aren't too comfortable or you suffer from dry itchy eyes a lot, visit your optician to check your prescription, then try a different brand of contact lens to find the most comfortable option. Remember, you can also get a free trial on most of the big brands like Acuvue too.